Tonight on FOX Gotham continues with an all new Monday September 21, season 2 premiere episode called, “Damned If You Do…,” and we have your weekly recap below for you. On tonight’s episode, Season 2 opens with Penguin being asked for help from an unlikely source: Gordon, whose moral compass is out of whack following a shakeup in the police department. On the last episode, when the key witness in a homicide ended up dead while being held for questioning by the police, Gordon suspects that it’s an inside job and looked to an old friend for information. Meanwhile, Oswald Cobblepot takes control of one of Fish Mooney’s prized possessions, as she got a small taste of her own medicine. Did you watch the last episode? If you missed it, we have a full and detailed recap right here for you. A month has passed since the events as we know it came to change everything about the City of Gotham. And to be quite honest the city does appear to be the better for it. Apparently the new king, our once adorable Penguin, has been so intent on killing off his rivals and consolidating his powerbase that the city had been allowed to flourish in the meantime. Meaning no gang wars and the only people kicking up fuss were the usual weridoes. Such as Zaardon who believed he drank the blood and was invincible. But eventually all good things must come to an end. And Gordon couldn’t stop them all as easily as he took out Zaardon. Gordon had later gotten fired from the GCPD. Internal politics were at play and some felt he was too much of a wild card or to be even more frank no one wanted a goody two-shoes around. So firing him seemed like the best bet for most of their careers. Yet Gordon was one of the few people that could fight for the city. Actually fight for it and not be caught making deals when no one is looking. So the young man didn’t just want to give up at the first sign of trouble. And if he couldn’t be certain people then he was willing to join them – he followed up his last day on the job with a visit to the new King. Gordon had gone to him seeking a favor. Gordon had once saved Penguin during the recent conflict in the battle for the city and so he felt Penguin owed him one as well. However nothing comes for free under the new regiment and Penguin wanted Gordon to do something underhanded. But that would ultimately help Penguin in his bid of holding onto the city. Yet when Gordon realized he couldn’t go along with someone else’s plan – his chances of getting his old job back were suddenly nil. And like it was said Gordon was one of few. Which is too bad because unfortunately, after their month of peace was up, Barbara had been transferred and she soon came to join the others like Jerome Valeska behind bars. And let’s say it wasn’t all that hard for a pretty face like Barbara to make friends. Truthfully, she was barely in there an hour before Jerome stopped by to make her an offer. He told her he could help her make friends. And that she didn’t have to rely on the usual blockheads that wouldn’t do anything for her but were still useless. In fact he was willing at the time to introduce to the man that had been running this prison and so could help her get her hands on a phone. Barbara had missed someone on the outside and all she wanted was to find a way to connect. But Gordon is not the man he used to be. And after he told Bruce about what happened – the same kid he promised to get justice for – he ended up getting guilt-tripped into working for Penguin. Some guys owed debts to Falcon and didn’t think they should still pay them what with Falcon being gone. So Penguin sent in Gordon to get his money. And, in amidst of a blood bath, that’s exactly what Gordon did. He killed a few people here and there to get the job done but he did get Penguin his money. And afterwards Penguin promise to uphold his end of the deal. But our lovable Jim Gordon was hurt by what he had to do. And thus having Barbara call him from prison, while he was at his lowest, wasn’t what he needed right then and there. His ex was still crazy. Trying to convince him she was innocent of murder one minute and then calling his new girlfriend to threaten her life. She couldn’t convince him to forgive her and he didn’t want to bother with her at all. Though ignoring Barbara is going to be hard in the future. It was easy to dismiss a crazy woman’s ranting when she was behind bars but its harder to avoid her when she escapes the bars. New players Theo and Tabitha Galavan used the hapless Zaardon to get a knock out drug into Arkham asylum and once they had dosed everyone they needed – the siblings then proceeded to kidnap a bunch of criminals. Who they hope will be useful to them in spreading panic and mayhem throughout the city. As for Gordon, Penguin got him his job back. And not as a beat cop either. Gordon is back wearing his suits. And Bruce ended up finding a way into his father’s secret study. Though all he really found was a letter addressed to him. His father had wanted to prepare him for the hard choices that the now deceased man apparently knew his son would have to make. 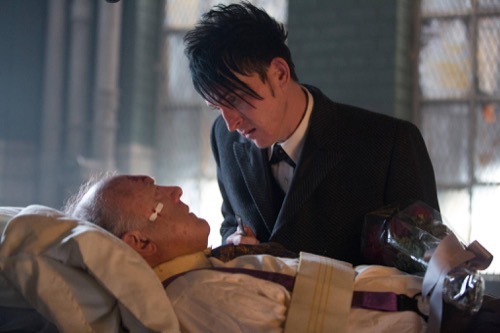 So this season of “Gotham” is going to be filled with many ups and downs! Please Stay Seated!